Black History Month, celebrated each October, is getting off to a great start this year. Kicking everything off on Saturday 30th September will be a whole day of great activities in Bangor. Starting at 10am, Storiel provides the morning venue for a Cuban bata drumming demonstration plus presentations on the shared history between North Wales, Africa and the Caribbean. A highlight will be spectacular performances by carnival drumming band Bloco Swn and martial arts/Brazilian dance group Capoeira Mocambo, which will take place at Bangor town clock at midday, followed by a parade back to Storiel. The afternoon at Storiel is filled with African/Caribbean food tasting by Maggie Ogunbanwo, a Capoeira workshop, Rhythm of West Africa drumming, stalls, displays and discussions. Marian Gwyn, Regional Coordinator for Black History Month Wales confirmed that a special treat at this year’s event would be Anansy the Spider. ‘Anansy’, Marian said, ‘is a famous African/Caribbean spider character who tells traditional tales. I’m delighted that Joy Roxborough will be bringing Anasy to life in storytelling sessions morning and afternoon at Storiel on Saturday’. ‘Everything is free’, she continued, ‘and everyone is welcome, so just join in! The entire event is managed by local groups including the North Wales Jamaica Society, the African Caribbean Society and Learning Link International, and is supported by the Arts Council of Wales and Race Council Cymru. See our North Wales Black History Month website for more information and find us on Facebook’. Black History Month takes place each October and is dedicated to celebrating not only the connections between Britain, Africa and the Caribbean but also recognises the contributions of black people to British society and culture. 2017 is the 10th anniversary of commemorating Black History Month in Wales and there will be lots of events and activities going on throughout October. ‘Help us celebrate it in style’, added Marian, ‘by putting on your own activities. See the Black History Month Wales/Mis Hanes Pobl Dduon Cymru website for more information’. 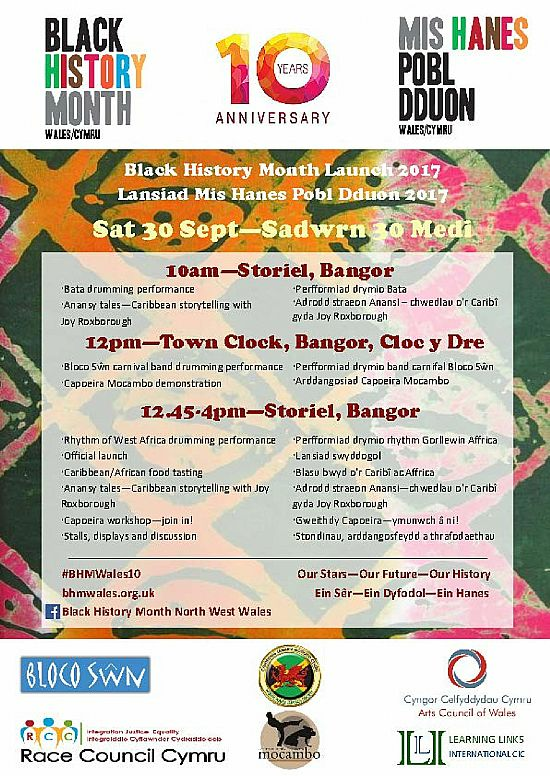 Saturday 7th October: African Caribbean Society BHM celebrations, fashion show, poetry and presentations @ Powis Hall, Bangor University. NB this is a student event and not open to the public. Wednesday 11th October: "Jamaican Evening" with Dr Marian Gwyn and Liz Millman from the North Wales Jamaica Society @ Anglesey Federation of WIs in Llanfairpwll WI Hall at 7pm. All welcome, with Jamaican style refreshments! Thurs 26th Oct: Occasional Cinema at Blue Sky in Bangor for a showing of the brilliant film “Hidden Figures” which tells the story of the team of Black African American female mathematicians, who undertook a vital role in the early years of the NASA space programme. Talk by Dr Marian Gwyn on the links between North Wales and plantations in Jamaica @ Denbigh in Archives? ?? a meeting of ACS students to talk about African history and the shared history of countries that students come from and Wales and to find out about the African languages spoken by ACS students.